I think I encountered a bug in widget rotation. If the rotation value is set to "x:A y:0 z:0" or "x:0 y:B z:0", either by setRotation() or by XML property, where A and B is non-zero positive values, the widget is rotated in strange manner. 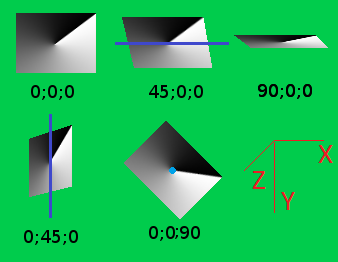 When point is rotated around any axis in 3D, the component of point vector corresponding to axis is not changed. For example, if (a,b1,c1) is rotated by an arbitrary angle around x-axis, then new coordinates will be (a,b2,c2). I found that CEGUI changes the axis-component of a point, making the widget looking skewed instead of rotated. The rotation angle of 90 degrees around x or y-axis should make the widget (effectively) invisible, but the closest angle to make the widget look like line (=invisible) is ~99.35. The image is attached. However, rotation quaternion (and rotation matrix I calculated from it) looks good to me and there are no issues with rotation around z-axis. I use OpenGL3 renderer and played with glMatrixMode(), gluPerspective() and their friends to make sure it is not a viewport problem to no avail. This behavior occurs in v0-8 branch (v0.8.7 release 6267 (ed25a866ade7), tip 6740 (bd98855c1589)) and v0 branch (tip 6719 (fdb23c8a311b)). Am I doing something wrong? Is this bug or expected behavior? I would not say it is expected behaviour. For a 90° rotation I expect this widget to vanish, just as you said. Ident wrote: Do you have any guesses? I did quick tests, and found that the rotation in samples built with glfw2 & OpenGL3 works as expected. Moreover, glfw3 & OpenGL3 works as expected too! I will investigate further later this week. That is extremely odd. Glfw just sets up the host window and some OpenGL stuff but this should not have any effect whatsoever on mathematical computations on the GPU, especially with OpenGL3 core profile. Did you say the application_templates with glfw3 is always broken, already as it is in the repo? Ident wrote: That is extremely odd. Glfw just sets up the host window and some OpenGL stuff but this should not have any effect whatsoever on mathematical computations on the GPU, especially with OpenGL3 core profile. MS Visual Studio 2017 Community, glfw-3.2.1, glew-2.1.0, other dependencies is downloaded as package from https://bitbucket.org/cegui/cegui-dependencies/get/v0-8.zip. Everything is built as debug version using CMake GUI 3.13.3. Create new project "Classic Windows application"
And setting angle to 90 does not make the button invisible. renders the widget invisible, as expected. Looks like the projection matrix is wrong. So, I figured what is wrong exactly. Either in glfw template, or in samples framework everything is the same. Sorry for misleading. Moreover, I feel that setting the pivot does nothing or little. I will try to locate the bug. I've built CEGUI with Directx 9 and tested rotation. The results are identical. Ok so at least it is consistently wrong. I don't quite get your examples with the rotation. Are you saying that the sizes on screen affects skewedness? Yes, the size / position on the screen affects rotation in general. launch, and you will see nothing. It is right behavior, as we discussed earlier. you will see skewed widget. Nothing renders. So the rotation center (axis-wise) should match center of root (?) frame. If hierarchy is complex, the situation gets complicated and I can't figure if there is a way to rotate a widget properly. The complex hierarchy means even another square shaped and root-centered frame that contains rotated widget. Also I tried to use setPivot(), but has not succeeded. Sorry if I'm not clear enough and thank you for your help! 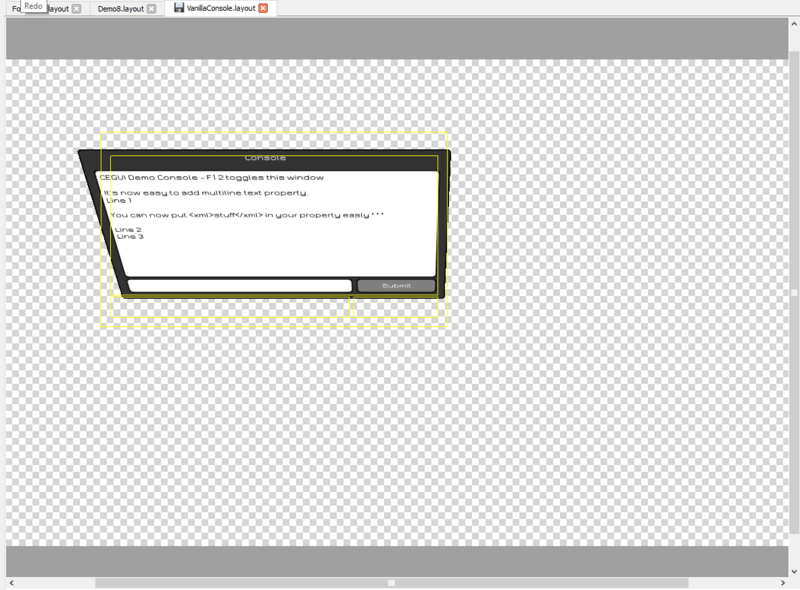 The transform matrix looks good to me, checked it in OpenGLGeometryBufferBase::updateMatrix(). The bug is renderer independent. It is connected with wrong rotation pivot. Sorry, i was editing my post while you were writing.. this got a bit confusing now. What I wanted to add is: what I observed there was a totally normal and expected distortion as given by a perspective projection. We do not use a orthographic projection here. Just as an example, I went into a famous and popular proprietary game engine, which I shall not name here because it does not use CEGUI , and just rendered a quad there rotated by 45° around X and moved it sideways, while the camera was facing it perpendicularly (before rotation). Therefore: nothing wrong with how CEGUI renders this. Back to CEGUI and OpenGL (etc.) - I did not test the pivot because there is no property for it and I personally find it insane to set a pivot per widget who is gonna keep track of the pivots and positions like this? Did you actually set one for the widget? It should work if you set one, I looked into the code and it is used properly afaik but I did not test this. So what exactly would you have expected instead of the perspective project Cizion? Maybe you should try setting an orthographic projection matrix instead? Could you explain your expected behavior further? 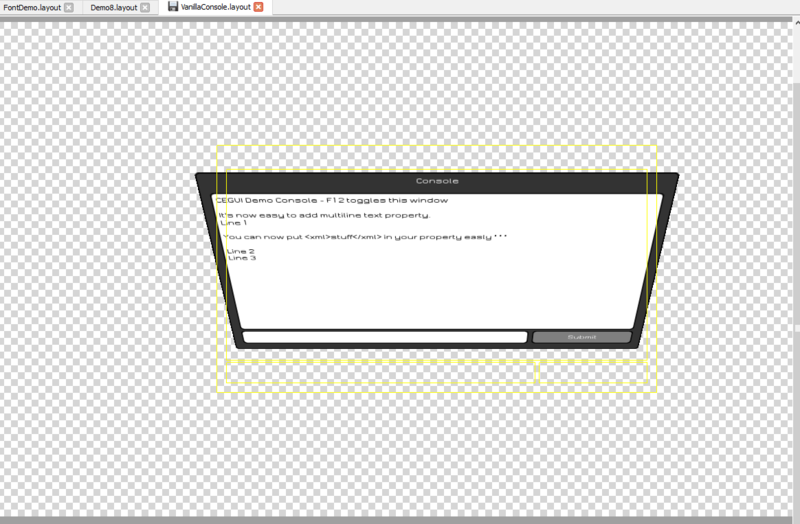 You can change the projection in cegui/src/RenderTarget, look for glm::perspective. At least that is what we use on default branch. Might be a different method on 0.8.X but should be in the same area and I think you get the idea. Suthiro wrote: Is this bug or expected behavior? Ident wrote: ..what I observed there was a totally normal and expected distortion as given by a perspective projection. We do not use a orthographic projection here. Suthiro wrote: .. played with glMatrixMode(), gluPerspective() and their friends..
but I have not thought that CEGUI uses its own projection matrix, and was changing things outside, after renderer initialization. Ident wrote: You can change the projection in cegui/src/RenderTarget, look for glm::perspective. At least that is what we use on default branch. Might be a different method on 0.8.X but should be in the same area and I think you get the idea. Thanks! I'm not sure if I will change projection matrix or use current setup, but at least I do understand now what is going on and where to look. Ident wrote: So what exactly would you have expected instead of the perspective project Cizion? I would expect 2D GUI system using an orthographic projection . And may I wonder what/who is Cizion? I will test pivots further, I suppose everything is ok and I just used it wrong.